Yesterday morning, Radio Cornwall's Breakfast Show painted a glowing picture of the fishing industry in the land of St Piran to celebrate the saint's day. Although only one boat had landed fish on the market that morning there was plenty to talk about with some of the key people who make a living from fish - whether it be from market manager Lionel Washer keeping a watchful eye on sorting and grading them, auctioning them in the case of Ian Oliver, acting as fish merchants like Rob Wing and Ian Greet from Falfish or even catching them in the case of CFPO's Andy Wheeler and Nathan de Rozarieux. The fishing industry seemed to be basking glow of the early morning light as captured by Through the Gaps that morning. 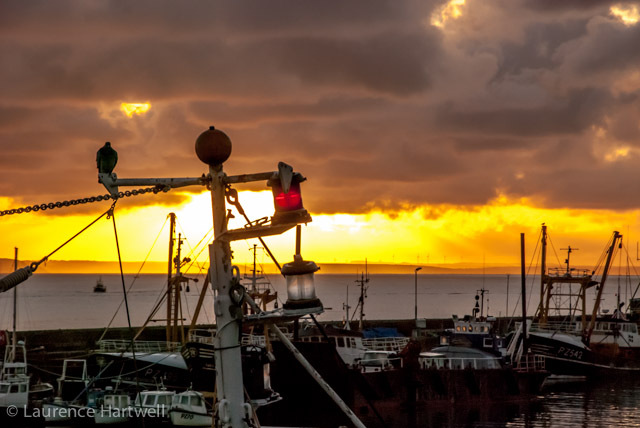 Not too many miles away at the wheel of his 33ft inshore trawler, Celestial Dawn, skipper Peter Green was listening to the show while steaming out of St Mawes to the trawling ground in Falmouth Bay. Peter can trace his family back to Tudor times; almost all his ancestors have fished for a living. Although it bears a Scottish registration (UL), The Celestial Dawn was built in Cornwall in 1989. From Peter's not-so-comfy chair in the wheelhouse of his tiny inshore boat the industry being discussed seemed a million miles away from the one he is experiencing at present despite enjoying the same sun's rosy-glow as he headed out to open water from Carrick Roads. With a new plaice quota of 100Kg for the month Peter was seething - he is currently catching that amount with almost every haul. Listen to extracts from Laurence Reid's show later in the day as local fish merchant Rob Wing who takes fish from Peter's boat gives a slightly more realistic view of the industry and then a few words from Peter himself as he tows over the trawling ground in Falmouth Bay.